Nintendo has launched both an exciting new game and a cool new system to play it on. Canadian residents can now get their hands on two of the hottest video game products of the year: New Super Mario Bros. 2 and the new Nintendo 3DS XL portable system. Nintendo 3DS XL offers screens that are 90 per cent larger than the original Nintendo 3DS, and sells at a suggested retail price of $199.99. The newest game to play on the system – or the original Nintendo 3DS system – is New Super Mario Bros. 2, the follow-up to the best-selling Nintendo DS game of all time, which sold more than 10.3 million in the United States alone. For the first time, Nintendo is giving consumers a variety of ways to buy the game. Shoppers can purchase a packaged game as usual at retail locations nationwide. They can go to a participating retailer and buy a code to download the game directly to their Nintendo 3DS system over a broadband Internet connection. Or they can simply purchase and download the game on their own from the Nintendo eShop using a wireless broadband connection. Regardless of purchasing method, the game sells at a suggested retail price of $39.99. Gold coins are everywhere in New Super Mario Bros. 2, and players will want to collect as many as possible. Coins trail after enemies and rain down from pipes. Various power-ups turn Mario into a coin-making machine, while special pipes transport him into caverns filled with coins. For the maximum coin carnage, players can transform into Gold Mario to shoot golden fireballs and turn almost anything into coins. There are also new connectivity features in New Super Mario Bros. 2, such as Coin Rush mode. Go for the high score while rushing through three levels back-to-back. Players can try to top their own coin tallies or see if they can beat the scores of players they encounter via StreetPass. Players with wireless Internet access can also add their collected coins to the global coin total via SpotPass. For the first time in a portable Mario game, two players, each with a Nintendo 3DS system and game card, can play through the entire game together as Mario and Luigi over a local wireless connection. While playing through the levels together, each player will get double the amount of coins. Additionally, this unique cooperative mode lets one player become the leader and take charge of what is viewed on the screen. This allows veteran gamers to help players who are not as familiar with a traditional 2-D side-scrolling Mario game. It also encourages healthy competition as players battle for leadership in this mode. 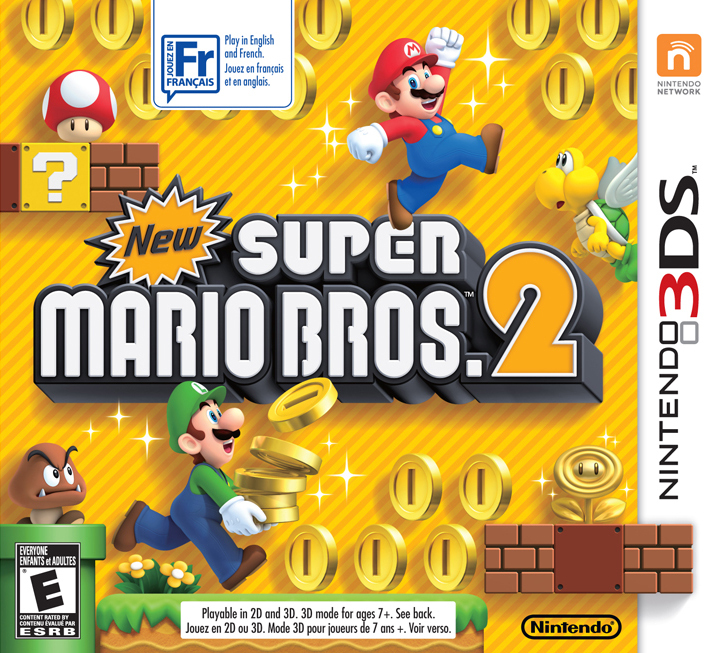 You can read a full review of New Super Mario Bros. 2 over at our reviews partner site, Canadian Online Gamers. This entry was posted on Monday, August 20th, 2012 at 9:58 am and is filed under Everyone, Mobile, National News, New Releases, Platform. You can follow any responses to this entry through the RSS 2.0 feed. You can leave a response, or trackback from your own site.